Let's tsay together, please: Shah calls on Nitish. 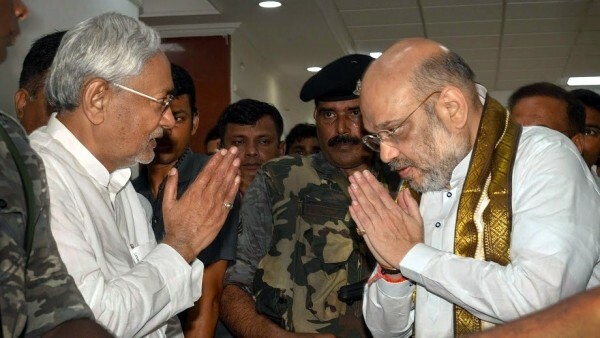 After breakfast together, BJP President Amit Shah again met Bihar Chief Minister and JD-U chief Nitish Kumar at dinner where they reportedly discussed seat sharing between NDA allies in the state for the 2019 general elections. The meet spread across Thursday was seen here as a part of dinner diplomacy to end the days of speculation over a rift between the Bharatiya Janata Party (BJP) and the Janata Dal-United (JD-U) and to send a message to both party rank and file that all is well in the NDA in the state. According to a senior BJP leader, only few selected top leaders from both parties were invited to the dinner. JD-U sources said Shah and Nitish Kumar had one to one talk during dinner in an adjacent room. Shah and Nitish Kumar were meeting for the second time within eight hours. The BJP chief who is here to interact with party leaders and workers to design strategies leading up to the 2019 Lok Sabha polls, met Nitish Kumar soon after his arrival from Ranchi. He headed straight for the state guest house near Raj Bhawan, along with senior party leaders to break bread with Nitish Kumar, a key NDA ally. During his day’s engagements, Shah made it clear that the BJP and the JD-U would jointly contest the 2019 Lok Sabha polls and win all 40 seats of Bihar. “BJP-led NDA’s alliance with Nitish Kumar will not break, it will continue. We are with Nitish Kumar and will continue with him,” he said while addressing the party leaders and workers. Noting that BJP knows how to manage its allies and continue with them, Shah attacked the Congress, saying that it was in Bihar that the campaign for a Congress-free India was started and the time has now come to uproot Congress from the country. “End of Congress will take place in Bihar,” he asserted. Shah said BJP will form a majority government at the centre in 2019 and Narendra Modi will be Prime Minister. Earlier, at his arrival, a team of BJP leaders, including Union Ministers from Bihar, and Sushil Modi thronged the Patna airport with garlands to welcome Shah. This is Shah’s first visit after Nitish Kumar’s JD-U joined the National Democratic Alliance in July 2017 after dumping the Rashtriya Janata Dal and Congress of the Grand Alliance. Unprecedented security arrangements had been made for Shah’s visit. The state capital has been turned into a fortress with thousands of security personnel deployed and traffic diversions in place. The entire city was flooded with colourful hoardings, banners, gates and posters highlighting the achievements of four years of the Narendra Modi government at the Centre. The shah was to hold a series of meetings and discussions with the party leaders and workers on the preparations leading up to the 2019 general elections.